Vandiver’s Missouri Corn Planter – Featured concave shaped press wheels and coverers that formed a 10” wide ridge that the corn seed was pressed into. The ridge allowed the farmer not to have to rake the seed furrows shut and also kept birds from eating the seed. The machine was also a self dropper which required no checker (2nd person) except when planting cross row corn. The planter was praised for its ability to plant at various depths and in various soil types. The Vandiver was a Missouri made machine that was also developed by a Missouri farmer. 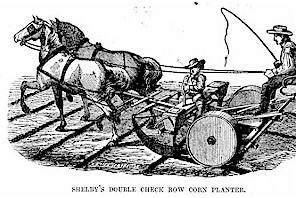 Shelby’s Double Check Row Corn Planter – Shown in the 1865 Missouri Annual Agriculture Report, this planter was depicted as one of the new age corn planters that was a newly invented implement that saved labor and stated that many who use the Shelby consider it and indispensable part of their farm. 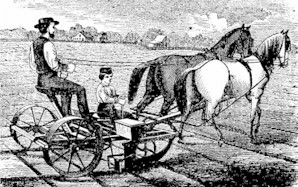 The machine used its wheels as press wheels that rode over the seed furrow and could be used is row planting or in cross row planting which is depicted in the picture shown. 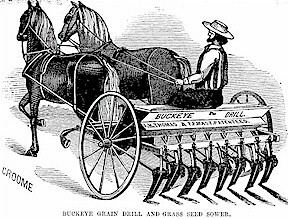 “Buckeye” Grain Drill and Grass Seed Sower – Got its name from being manufactured in the state of Ohio. Was well known and very popular in every grain growing state in 1865. A seed broadcaster could also be attached to the back of the machine to spread cover crop grasses on the ground between the drilled rows. The buckeye promised and delivered in giving wheat growers in Missouri better grain and hay yields. This was accomplished by the drill being more accurate in seeding rates and putting seed into a furrow which gave more seed to soil contact and thus aided in germination and made for better stands of crop compared to hand sowing seeds.